DOYLESTOWN (PA) – Undefeated Delaware Valley University has moved up two spots to seventh in the latest American Football Coaches Association (AFCA) Division III Top 25 poll while maintaining its grip on the number 10 spot in the D3football.com Top 25 rankings. 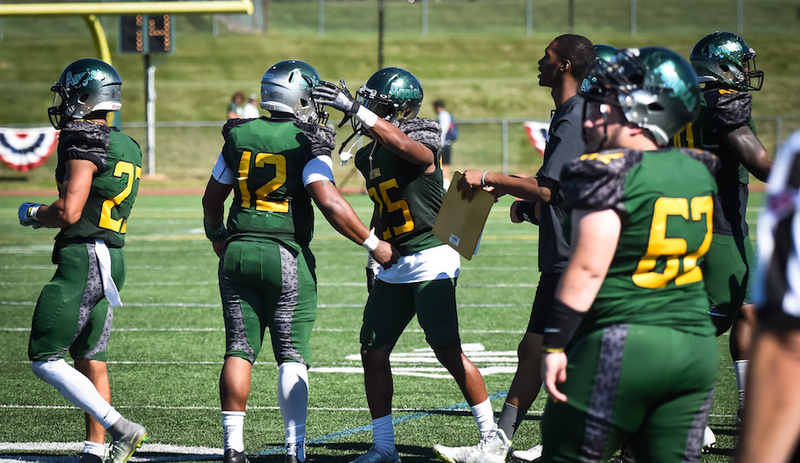 DelVal received 914 points in the AFCA poll after its 60-7 triumph at FDU-Florham on Friday, September 29. That victory improved the Aggies to 5-0 overall and 4-0 in the Middle Atlantic Conference. Only defending champion Mary Hardin Baylor, Mount Union, Wisconsin-Oshkosh, North Central, Hardin-Simmons and St. Thomas are ranked higher than DelVal in the coaches’ poll. For D3football.com, the Aggies received 391 points to remain 10th for the second week in a row. Mary Hardin-Baylor heads that poll as well. DelVal is preparing for its big “Battle of the Unbeatens” conference showdown at Albright College on Saturday, October 7. The Lions, also 5-0 and 4-0, moved into the top 25 in the AFCA poll as they hold the number 24 position. They are receiving votes in the D3football.com poll. Kickoff at Shirk Stadium in Reading, Pennsylvania is scheduled for 1 p.m. on Saturday.